Thierry Henry is one of the best football players of his generation and has consistently supported SRtRC and other anti-racism campaigns. In October 2016, SRtRC had the opportunity to talk to the former France, Arsenal FC, Barcelona, New York, Juventus and Monaco striker about racism and he shared his advice for young people and thoughts about the issue. SRtRC has produced a series of short clips from the interview and will upload several of these to YouTube. This was the first time we had interviewed Thierry since his spell at Barcelona. A big thank you to Thierry for being so generous with his time and to UNISON for their assistance with filming. In this first part of the interview Thierry talks about what you should do if you experience racism. In Part 2 of the interview, Thierry shares his advice for young people experiencing racism in school. Thierry Henry talks about how he feels when he hears of racist incidents in Part 3 of the interview. Thierry discusses unintentional racism, jokes and 'banter' in part 4 of the interview. Thierry describes what it was like to be part of the hugely multicultural and highly successful France National Team and reflects on how thier achievements were viewed by the public. Thierry Henry discusses the positive impact that working with team mates from other backgrounds has had on his career and his personal life. Thierry reflects on the human tendancy to judge other people and on the challenge of trying not to be judgmental. Thierry considers whether racism is a problem for sport in the USA, and describes the fact that he never witnessed any racism in soccer, basketball or whilst living in New York. 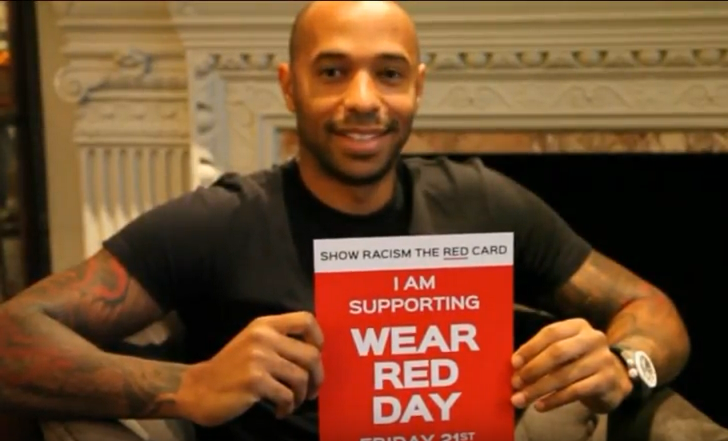 Thierry Henry discusses the impact of the Show Racism the Red Card campaign and his reasons for getting involved.